Centrally located in the heart of Paris's Marais district, Hôtel de Neuve is just a 5-minute walk from Place de la Bastille and the River Seine and 300 metres from place Vosges. It offers air-conditioned rooms with satellite TV. The guest rooms at the Hôtel de Neuve are soundproofed and have a private bathroom. All rooms are serviced by a lift. The Hôtel de Neuve serves a continental breakfast every morning, which can be enjoyed in the dining room or in the comfort of the guest rooms. A free tea time is also offered everyday from 14:00 to 17:00. It includes wide range of coffee, tea, cakes, sweets and juices. The staff are available 24 hours a day to offer assistance. The Hôtel de Neuve is just 230 metres from the Saint-Paul Metro Station, providing access to all of Paris. Both the Pompidou Centre and the Notre Dame Cathedral are a 15-minute walk away. The Hotel is located in the calm of a quiet side street. It used to be a town house, transformed in hotel during the twentieth century. The building remained absolutely charming and its wood stairwell has not changed. It has been recently renovated and features an inviting lobby with warm colours and a cosy breakfast room. It offers a discrete luxury, which is worthy of its three stars standing. There you will find a perfect place to relax at the end of a busy day. Your hosts will be pleased to help you discovering the most famous places of interest in Paris and around the hotel. 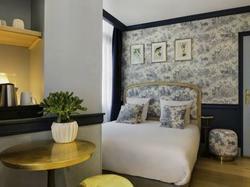 A few minutes away from the Marais and its charming little streets, behind the river Seine, the Hotel Jardins de Paris Marais Bastille is the guarantee to spend an unforgettable trip to Paris. This delightful offers Parisian charm and personalized service in the heart of Paris. In this district, you will find the Carnavalet museum, the house of Victor Hugo and the Picasso Museum. A few minutes away from the hotel, the Place des Vosges is a relaxing garden. The Parisians appreciate it much when comes the summer. You can also reach all the monuments of the capital thanks to the bus and underground lines near to the Hotel Jardins de Paris Marais Bastille. A continental breakfast is served in the dining area from 06:30 to 10:00.